Takeaway: Employees in an ergonomic work environment are healthier and more productive — here are 5 key factors to consider when creating ergonomic workstations. In practice, this means setting up the work environment, including individual workstations, in a way that is responsive to each worker’s physical body and abilities. Ergonomic workstations keep workers from experiencing undue stress or strain. As a result, ergonomics supports both the worker’s health and their productivity. An improper workstation setup can lead to musculoskeletal disorders (MSDs). 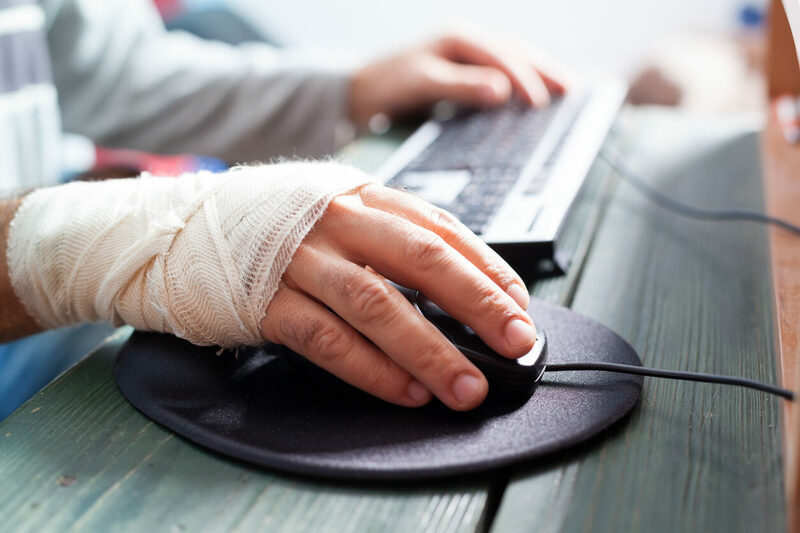 More than just pain or soreness, MSDs can lead to debilitating workplace injuries, which can in turn lead to expensive healthcare and disability costs. Before a worker experiences a debilitating injury, all of these stresses, strains, and traumas can undermine their productivity. As they begin to feel pain and discomfort while completing their tasks, workers will slow their pace in order to alleviate their discomfort, and end up producing less. Ergonomic workstations, properly adjusted and used by each worker, help avoid all of these stresses, traumas and strains in the first place. Ultimately, they support worker health, safety, and productivity. (Learn more in 10 Important Ergonomic Aids For Office Workers). Because ergonomics addresses the needs of the individual worker, and not all workers are physically alike, a one-size-fits-all approach won’t be effective. Ergonomics need to address a full range of workers, from the shortest to the tallest, and a full range of tasks, from desk work to the assembly line to machine operations. The ergonomic solutions you implement will need to take into consideration every worker and every job in your organization. In all likelihood, you’re going to have to spend some money to create ergonomic workstations. Chances are you will have to buy furniture, tools, and/or work aids. You may have to hire a consultant to design the workstations, oversee their installation, and train your workers on how to best use them. At first an adjustable workbench or desk may seem like a more more expensive option than simply using a fixed table. (Learn more in 6 Ergonomics Aids For Employees Who Work In A Standing Position). But, by spending on ergonomics now, you avoid the expense of worker injuries later. It can be tempting to simply take a canned, off-the-shelf ergonomic design and implement it in your workplace. However, not every work process or every workforce is alike, so you need to find the solution that works for your particular work environment. The needs of your employees and workplace are unique. Only by studying your workplace in detail can you be sure that the ergonomic solution you choose will meet the needs of your workers and work environment. Physical differences between different employees, such as height, strength, and flexibility, can point to differing ergonomic needs. Things we don’t often think about, like whether someone is left-handed, can also influence their ergonomic needs. To get a complete picture of what your workers need, you must assess a significant cross section of your workers carrying out their tasks. Every type of job will need to be evaluated in order to build a complete picture. As with any major change in the workplace, it’s good practice to involve the people most directly affected early on in the process. Often it’s the people who do the actual work who are in the best position to judge whether a solution will truly address the problem. Their involvement will also build their sense of ownership in the change and desire for its success. A collaborative approach goes a long way in helping ensure that new tools and processes are adopted by your workers. Ergonomics may be unfamiliar to your workers and managers. It’s important for everyone to understand the basics of ergonomics and the benefits it provides. Once workers and managers understand how to make best use of ergonomic workstations and the benefits they provide, they are more likely to follow through with changing how they work and more likely to avoid injury. Investing in a customized approach to ergonomics will yield results for you and your workers. The time and resources you put into fitting workstations to your workers will ensure their health and safety in the short term and support their ongoing productivity in the long term. Corinna Cornejo is a marketing content writer and strategist who specializes in digital health, healthcare, and related topics.